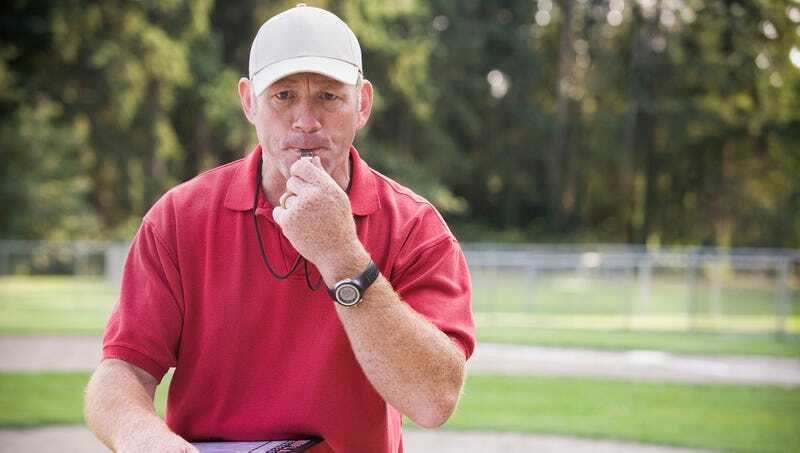 OKLAHOMA CITY—Saying they were caught completely off guard by his sudden act of assertiveness, onlookers at a Duncan High School varsity football practice reported Wednesday that second-year assistant coach Bill Vining had finally worked up the courage to blow his whistle. “Everyone just froze and we thought we were in big trouble or something,” sophomore cornerback Matt Baker told reporters, noting that the soft-spoken coach had rarely ever addressed more than a handful of players at once, let alone the entire team. “Even [head] coach [Charles] Pettis looked puzzled when he saw who blew the whistle. Once he had total silence and the undivided attention of every player, coach, and student on the field, he told us we had a big game this week and we needed to have a good practice today. It was really strange.” Players and coaches later confirmed to reporters that Vining ended the practice by offering to walk the offense through a new play he had drawn up.